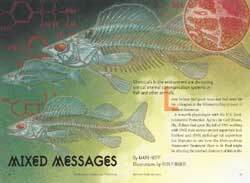 The latest article comment reading assignment in People and the Environment was the feature from the January-February 2002 issue of the Minnesota Conservation Volunteer, “Mixed Messages” by Mary Hoff. The article details the increasing discovery of endocrine disruptorsin the environment and their relation to anomalies of nature. In particular, this article revealed the presence of vitellogenin, a protein female fish produce as part of egg-making, in Mississippi River malecarp and walleye. The fish tested were pulled from waters downstream of the Metropolitan Wastewater Treatment Plant effluent in St. Paul. “Nobody blinked at the carp data, but when we found vitellogenin in male walleye, it was on the front page of the Star Tribune,” explains Leroy Folmar, the research physiologist with the U.S. Environmental Protection Agency who conducted the study highlighted by Hoff’s article. Well, of course, a carp is – well – a carp, an overgrown minnow, a rough fish, a Eurasian invader introduced to North American waters by humans long ago. But the walleye is the Minnesota state fish, and, for its beauty and table fare, the prize catch and most sought after game fish in the land of 10,000 lakes. The extent of the affects, the damages to the global ecosystem, of endocrine disruptors are largely unknown, but increased studies are producing more prevalent evidence. The process of recovery is slow because of the daunting task of identifying the vast array of individual chemical culprits and the equally vast array of abnormalities they produce. Then there is the “harmless” chemicals that bond with other seemingly harmless chemicals to form yet another endocrine disruptor. A web search turned up a 2005 Institute for Environment and Health compilation of published lists of Chemicals Purported to be Endocrine Disruptors – it’s 91 pages long! What are we putting into our environment? Why are we only concerned to a sense of urgency when it threatens human life or a desirable part of human life, if at all? Our environment is trying to tell us something – we’re poisoning our Earth. The Minnesota Conservation Volunteer is the magazine of the Minnesota Department of Natural Resources. A subscription to the magazine is free to Minnesota residents, and is truly a wonderful publication filled with the flora and fauna of the Minnesota landscape. However, I read the majority of the articles online because of the website’s fantastic online archive. I chose the hunting story “Wilderness Moose Hunt” by Chris Niskanen from the magazine’s September-October 2006 issue for our Minnesota Conservation Volunteer article comment assignment because I am a hunter and an outdoorsman. But the struggle of the Minnesota moose herd is a sign of our changing environment as well, and easily relates to the topics we have been discussing in People and the Environment. Moose hunting is enormously popular in Minnesota. In 2005 the DNR received applications from 3,060 parties of two to four hunters for 284 moose tags in 30 zones. Minnesota is among only a dozen states where moose are hunted and among fewer where the experience can demand wilderness canoeing and backcountry woods skills—the makings of an exquisitely primitive hunt. Only Minnesota residents can apply for and win the once-in-a-lifetime tag…. …Moose are North America’s largest deer species. Minnesota specimens, known as the Canada subspecies, can weigh up to 1,300 pounds. For their size alone, they capture the imaginations of hunters, present and past. Researchers are feverishly working to find the reasons why the population has seen such a drastic decline. Some theories suggest that warming climates leading to heat stress, encroaching exploding deer populations, and parasites like liver fluke, brainworm, and winter ticks as well as predators and habitat loss are the contributors to the decline in numbers, but so far a hard and fast reason has eluded researchers. It may be a combination of these reasons, so researchers are intensely studying the herd looking for clues that will suggest the cause and possibly ways to help the moose fight what is threatening the herd. 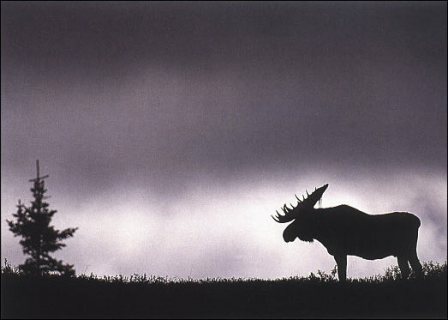 Declining moose numbers are not unique to Minnesota. When I searched the web for information on some of these threats, I found numerous sites, studies and articles that have documented some of the research that has been done all over moose’s North American range. Below you will find links to some of the best of those findings. In reading the above selected articles, you’ll find that heat stress is not the only reason why the moose is in decline, but a warmer climate is definitely affecting the range where these majestic animals can exist. Factoring in the ever encroaching human species as a contributor to habitat loss and introduction of disease via an exploding white-tail deer population gives a bleak outlook to the future of the moose herd in Minnesota. I remember when moose crossing signs stood along the roadside of Highway 2 west of Bemidji. Those signs are no longer there as the moose population in Northwest Minnesota has fallen to an estimated 84 as of 2007. However, I saw a sign to give me hope while returning from a recent fishing trip to Upper Red Lake. As I drove home through the bogs surrounding the lake, deep in thought remembering my day of fishing, something large came hurdling out of the bush on the right side of the road. I didn’t immediately recognize the potential obstacle, but I knew that what I was seeing out of the corner of my eye was large enough to impede my safe passage down the highway. I instinctively swerved into the empty oncoming lane in order to give this unexpected traffic a wide berth, and as I crossed its intended path it pulled up to a stop. At the moment of realization that the danger was gone, I was amazed to set my eyes on the source of my sudden deviation in course, a cow moose with her newly born calf in tow. I have seen moose in the wild before on hunting and fishing trips to western states and Canada as well as a particularly close encounter of my own in the Boundary Waters some years ago with a cow moose and her two calves. However, in the light of the current situation of the species here in the region I call home, this sighting was certainly a wonderful surprise. My thoughts along the road home of the day of fishing quickly changed to guesses at where this family was coming from and where they were headed at the moment of our chance meeting. I’m hoping a cool spring and summer will help that mother nurture her calf to a fortuitous start in life. I hope to one day have an amazing story to write about my own Minnesota moose hunt, but I hope the massive bull of my dreams will not be a ghost story of a species lost.